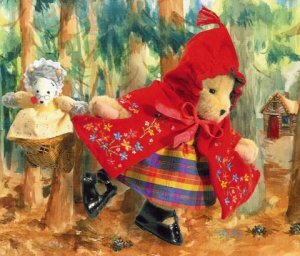 7",2003, Muffy as Little Red Riding Hood wears a red silky velvet cape embroidered with multicolored flowers over a coordinating custom woven plaid silk dress and pantaloons. She winds her way to Grandma's in black buckled T-strap shoes. A miniature wolf doll dressed as Grandma catches a ride in her wicker wheeled cart. MIB Pink Couture window box with a forest themed backdrop.